When you open Photoshop Elements’ Organizer, the default view is a Thumbnail display. Your photos, videos, projects, and audio files appear with a mini image or icon that can be adjusted to different sizes. On the Shortcuts bar, a slider can be moved left to create smaller thumbnail views or right to create larger thumbnail views in the Organizer window. 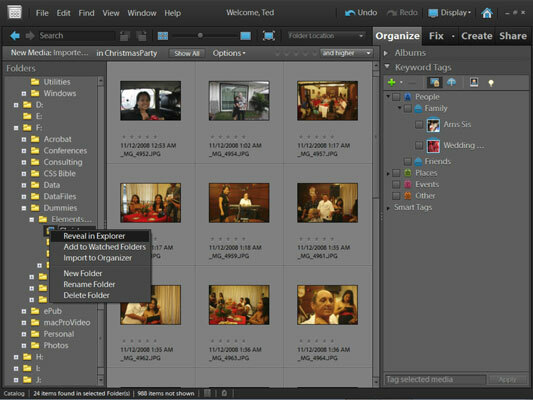 The Thumbnail display is one of many options for browsing photos and other files in the Organizer. A quick glance at the Display drop-down menu shows alternative views available to you. Click Display on the menu bar to see the options for alternative views in the Organizer. Below the default option for Thumbnail View, you find Import Batch. Open the Display menu and then select Import Batch, or press Ctrl+Alt+2 (cmd+Option+2 on the Macintosh) on your keyboard. The display in the Organizer keeps the view set to thumbnails, but the order of your files changes to reflect the date you imported files with the Get Photos and Videos command. This view can be helpful if you want to organize images according to the dates you imported them. What’s nifty about the Folder Location display is that you can peruse your hard drive for all files and folders while you remain in the Organizer window. Just select Folder Location from the Display menu or press Ctrl+Alt+3 (cmd+Option+3 on the Macintosh) to make an Explorer sidebar show you your hard drive(s), network locations, and offline media. For Macintosh users, when you see a reference to Windows Explorer type of view, you see a hierarchy of folders along the left side of the Elements window. Where you see a right pointing arrow, you find a collapsed folder. Click the arrow, and a nest of subfolders is revealed below the parent folder. When you want to poke around a folder, right-click and select Reveal in Explorer (Reveal in Finder on the Mac) from the contextual menu. Windows Explorer opens on top of the Organizer window and shows you all the files contained in that folder. On the Macintosh, a Finder view opens and displays the selected folder contents. Choose Folder Location from the Display menu and then right-click to open a contextual menu. When you find an image you want to edit, right-click and choose Open With→Adobe Photoshop Elements 9.0 (Editor). On the Macintosh, choose Open With→Adobe Photoshop Elements. The image then opens in Edit Full mode in Elements. When you want more of the screen window dedicated to seeing the files in the Organizer, hide the Panels Bin by clicking the separator bar. One click on the tiny right-pointing arrow on the separator bar hides the panel. Click the arrow on a collapsed panel to reopen that panel. The preceding figure shows the Organizer window with the Panels Bin hidden. Choose Date View (Ctrl+Alt+D, cmd+Option+D on the Macintosh) from the Display menu to change your Organizer window to a calendar showing you the dates your images were shot. 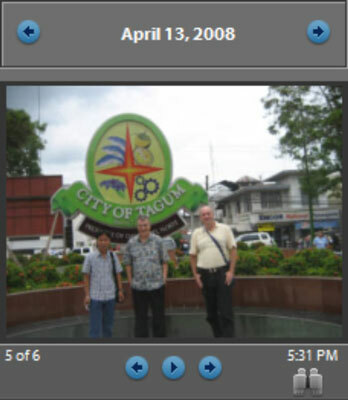 The date information is derived from metadata imported with your images, recorded by your camera. If you shoot many pictures on a given date, the images are stacked on the calendar for that date. In the right panel, you find arrows that are used to scroll the stacked images left or right, and a number appears in the lower-left corner of the image thumbnail in view. In the following figure, the numbers appear as 5 of 6; on April 13, 2008 (the date at the top of the thumbnail), six photos were taken, and the current view is the fifth photo in the stacked order. The right panel shows a thumbnail view of a photo with scroll arrows and numbers. To return to the Organizer thumbnail display, click the binoculars icon or press Ctrl+Alt+O (the letter O, not zero) or cmd+Option+O on the Macintosh.